Can you believe this table was a garage door? 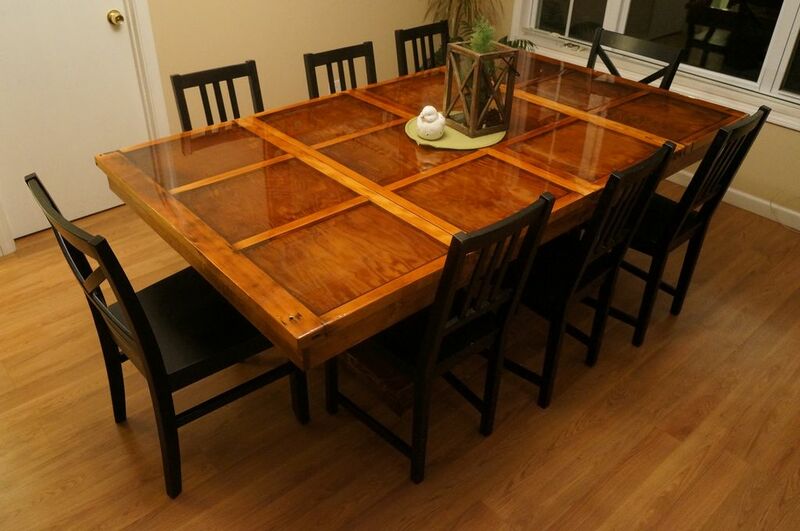 My jaw dropped when I saw member jmitch77 post his dining room table on Instructables. The honey color wood with what I thought was wood inlay caught my eye. My jaw dropped even further when I read he made this table from an old wood garage door. Removing 60 years of paint from the door made it a time consuming upcycling project. He chose to cover the top in resin which cost more than buying a new table. Resin is not the most Eco friendly choice but understandable. He wanted to level the door while still showing off the beauty of the wood door. Now I am tempted to troll back alleys for old garage doors. What about you? I adore a blogger with a sense of humor!!! I have to agree, I'd love to troll around for a garage door like that as well. Though you may not love your dining room table, at least you have that beautiful embroidered tablecloth from your mom...which is stunning. Perhaps the table could have an accident? Or be stolen by Ninjas? LOL! I absolutely love that garage door table, but I would probably just covered it with a piece of glass - I'm a lazy diy-er! If you find a way to make your dining table go away, please do share. Ours is a wedding gift my mother- and father-in-law gave to my husband... and his first wife. For fifteen years, I've put up with that table but, oh, how I would love for it to find a new home! This is jmitch77 author of the Garage Door Table Instructables post! Thank you so much for the kind words and referring others to see my table! Very cool! My husband just made us a farm table that we distressed to look old and we love it. Hope you can stop by the enchanted oven. This is so beautiful. My jaw dropped also. We have a link party called Wednesdays Adorned From Above Blog Hop and would love to have you share this and any other posts with everyone. It runs from Tuesday night through midnight Sunday. Here is the link to the party. Wow! That table is gorgeous! Who would have thought it was an old Garage door? Some people's creativity amazes me! It's gorgeous! Wow! Thanks for sharing, Lisa! This is great! Thank you for linking up at Fluster's Creative Muster.